In the run-up to Black Friday online merchants are luring customers away from the malls with the promise of free shipping. But savvy shoppers beware: not all 'free' shipping offers are created equal. Upon closer examination those highly advertised free delivery offers from Best Buy, Wal-Mart, Staples, Sears and JC Penney come with plenty of fine print surprises. Here is a look at how free shipping deals from some of the nation's major retailers stack up. If you visit BestBuy.com Tuesday you are greeted by this friendly little elf telling you the big box store is offering free shipping on "hundreds of thousands of products." Sounds like a great deal until you click on that "Learn more" link and find out that Best Buy's free shipping deal doesn't include "laptops, netbooks, iPads, iPods, Dynex TVs, video game consoles, major appliances, compact refrigerators, air conditioners, dehumidifiers, grills, outdoor furniture, pergolas, fitness equipment, [and] electric vehicles." So what's left? Well, most HDTV brands appear to be covered except for Dynex, and Blu-ray disc players are still in. But if you are looking for anything computerized or an electric scooter, you'll still be paying the freight. Staples had this banner on its homepage Tuesday morning offering free and fast delivery on purchases over $50. Sounds like a great deal if you're tired of fighting with printer annoyances or looking for a new all-in-one for your home office. Maybe a new camera delivered to your front door would be nice. But as soon as you click on the banner to find out more, you discover that Staples will only ship purchases to your local Staples store, and not your home. So much for avoiding that holiday rush. If you spend $99 or more on select items at Sears you'll get free shipping, as long as you enter the coupon code: SANTA. Sears is also offering free shipping on purchases over $49 if you buy clothes, accessories or beauty products. Sears also has automatic, no purchase minimum free shipping for shoes. That's right, shoes. 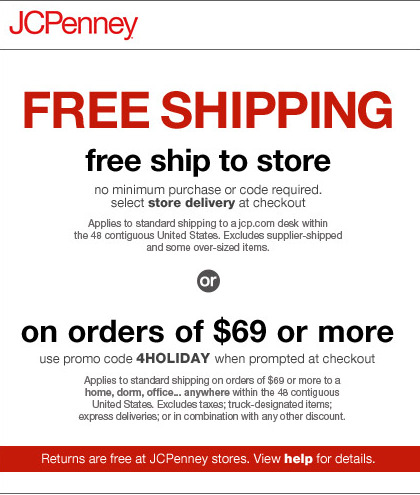 JC Penney is also offering free shipping for online purchases over $69, but don't forget to enter the JC Penney coupon code: 4HOLIDAY. Example of a free shipping offer from Wal-Mart. Retailers including Wal-Mart, New Egg and Amazon are offering free shipping on select items. These offers are pretty straightforward. Wal-Mart, for example, labels each item with "Free Shipping To Home" and others "Free Shipping to Store." So make sure you read your labels carefully. Best Buy may not offer free shipping for major appliances, but Home Depot is. The home retailer is offering free shipping on many purchases over $249 including washers, dryers, refrigerators, stereo speaks and other items. The only catch here appears to be whether the items you want are in stock. There may be other catches for free shipping other than what I've listed here. Most free shipping offers apply only to the lower 48, for example, so you're out of luck if you live in Alaska, Hawaii or Puerto Rico. Time is another consideration as free shipping, with the exception of Home Depot, is almost always sent via the slowest ground transportation available. So make sure you allow for at least 7-10 days for your order to arrive.